Come up with something – anything (though it has to be edible food) – that wouldn’t go well in a wonton. I mean, really. You can fold anything in a wonton skin, fry it up, and it’ll be delicious. And if you can’t come up with something that would do badly in wontons? Give me a cool, crazy, awesome, ridiculously creative combination that you would put in a wonton. Like these, which my great aunt asks me to make every year at our family’s annual Christmas party. Or like this recipe here – arctic char with dill cream cheese, drizzled with a maple ponzu sauce. I think I’ll give away a Sushi Day shirt and a sushi kit to the person who comes up with the best (edible!) suggestion for what WOULD NOT go well in wontons. And I’ll give away another Sushi Day shirt and a sushi kit to the person who comes up with the best GOOD combination that I can put in a wonton. You have 1 week to enter. That’s until next Thursday, November 18, at 11:59PM PST. The maple ponzu sauce was adapted from this maple-soy sauce, which was recommended to me by my friend Mike Kelly. Yum, yummy, yum. If the arctic char fillet has skin and bones, carefully pick out all the bones, and scrape the pink flesh off of the skin. Discard any bones and skin. By now the arctic char probably resembles a lumpy mush, but if not, chop it a few times until it does. Mix the cream cheese with the dill. 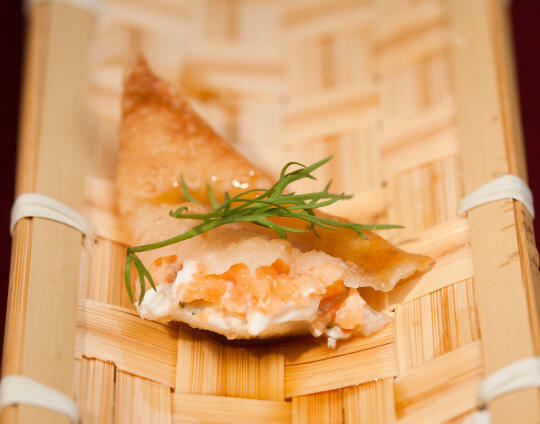 Spread a layer of cream cheese on one triangular half of a wonton skin, then top with about a tablespoon of arctic char. Dampen the edges of the wonton with water, then fold over the other half of the wonton skin and press along the edges to seal it. Repeat until you have used up the arctic char. Heat the oil to 400°F. Fry the wontons, about 10 seconds on each side. They should be a very light golden brown, just barely starting to brown around the edges. 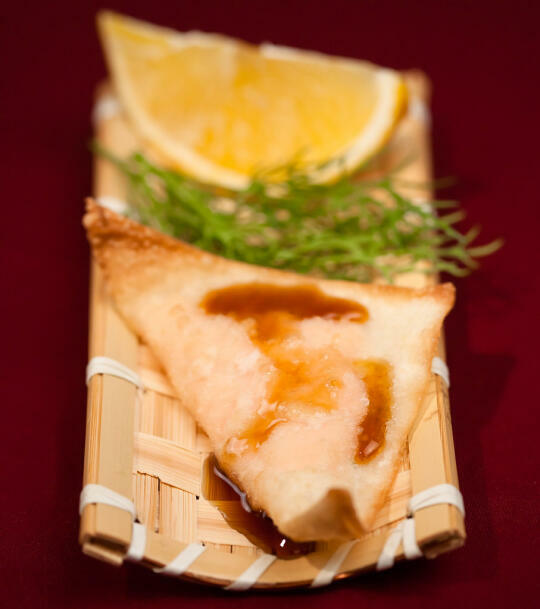 We still want the arctic char to be mostly raw inside the wonton. Drain on a cooling rack. Mix the maple syrup, shoyu, and orange juice. Drizzle over the wontons. That recipe looks delicious. I’m a bit hesitant to put in maple syrup, but I’ll try anything once. I think a wonton couldn’t go into a wonton. I think the worst combo would be sardines, green olives, grape jelly with rosemary flavored cream cheese. I am going to have a sushi party and was thinking of doing a wonton desert! I was thinking bananas, Nutella sprinkled with powdered sugar. Yum! I wouldn’t want to eat a wonton with pickled eggs, peanut butter, liver and brussle sprouts. I’m just saying, yuck! Your Artic Char Chowder from a couple of day’s ago looked really delicious. You could also add a few drops of Sesame Oil or Chili Oil to your Shoyu/Maple drizzle and it’ll add an extra layer of flavor to your Won Tons. Bad Won Ton combo: Chopped Balut with Cottage Cheese. What would NOT go well in a wonton? …. Hot dogs. Anything + hot dogs, or just plain hot dogs. The use of hot dogs as an ingredient in any other dish highly disturbs me. The bad: Jell-O would not go well in a wonton. It would just melt and make a mess, not to mention the fact that I don’t think it would be very palatable. PS. I think hot dogs in wontons would be AWESOME. The bad? How about some Spam, mashed and mixed with steamed spinach, grated ginger and tossed with raisins and dried blueberries. Or, you could do the same with aduki beans, only sweetened with a little brown sugar… just leave out the nuts and other flavouring. I’ve made wee pancakes with aduki bean paste and they were delicious.